The Stock Symbol, RIVE, was announced and welcomed as a public offering by Nasdaq representative Andy Hall. 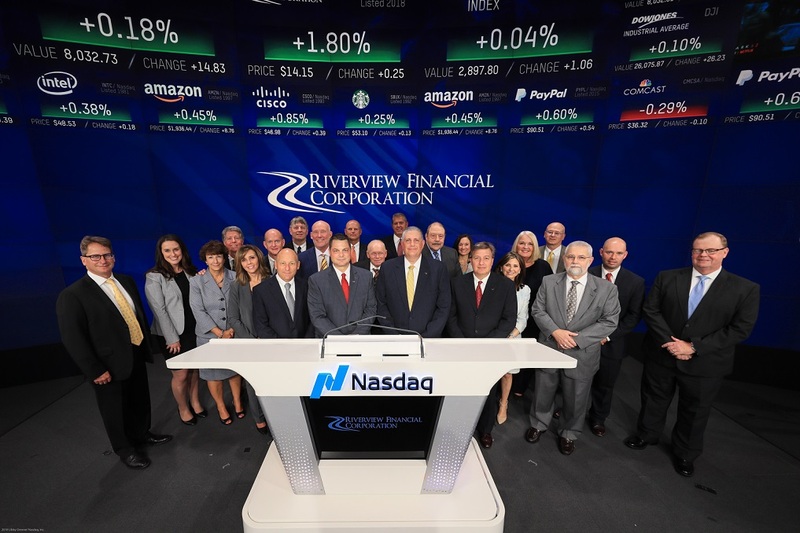 Shares of Riverview Financial Corp. stock began active trading on the Nasdaq on Aug. 14. At the ceremony, Kirk D. Fox, chief executive officer, and Brett D. Fulk, president, provided great accolades to the journey of Riverview Financial Corp., attributing its many accomplishments to the support of a forward-thinking board, leadership of an innovative management team and hard work of a dedicated team of employees. Fulk added, “To go from $80 million in assets in 2007 to $1.2 billion in 2017 is a tremendous growth story by any measure, but to have done so during one of the more difficult periods of our industry’s history speaks volumes about the determination of our team to successfully execute on well-planned strategic goals. The Wealth Management and Trust divisions, with assets under management exceeding $350 million, provide trust and investment advisory services to the general public. The company’s common stock trades on the Nasdaq Global Market under the symbol “RIVE.” The Investor Relations site can be accessed at https://www.riverviewbankpa.com/. Through its diverse portfolio of solutions, Nasdaq enables customers to plan, optimize and execute their business vision with confidence, using proven technologies that provide transparency and insight for navigating today’s global capital markets. As the creator of the world’s first electronic stock market, its technology powers more than 100 marketplaces in 50 countries, and one in 10 of the world’s securities transactions. Nasdaq is home to approximately 4,000 total listings with a market value of approximately $14 trillion. To learn more, visit: http://business.nasdaq.com.